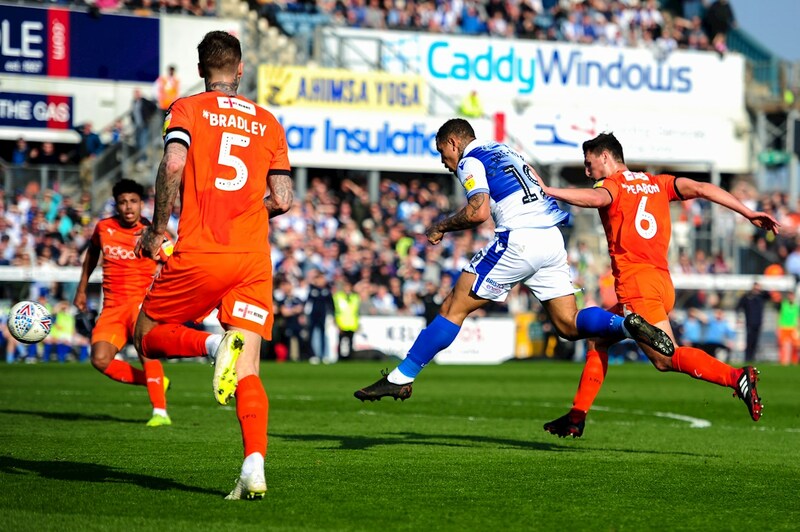 SkyBet League One leaders Luton Town continued their stunning form with a 2-1 win at The Mem, but they were given a fright by a Rovers side that refused to be rolled over. 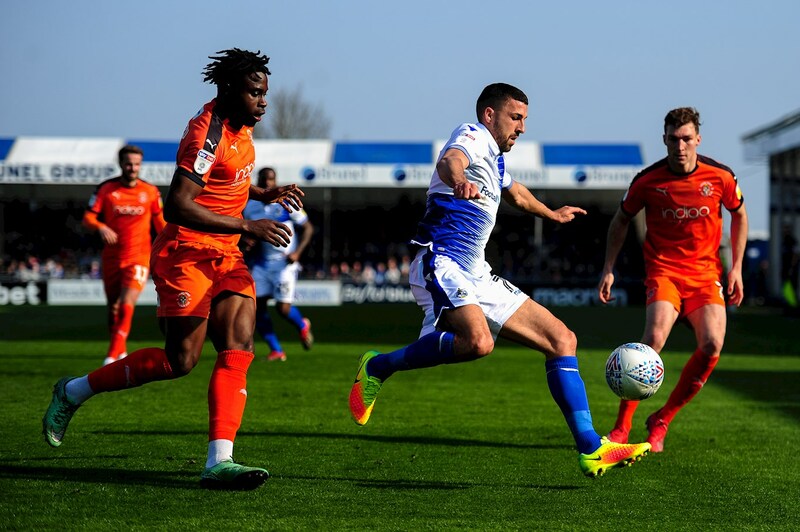 First half goals from James Collins and Luke Berry gave the Hatters a 2-0 lead, and some may have expected them to coast to victory, or add to their tally. Not a bit of it. Jonson Clarke-Harris finished a tremendous team move in first-half injury time to close the gap, before Rovers had several second-half chances to get a point for Mick Harford’s nailed-on promotion contenders. It was not to be, but Graham Coughlan must surely take heart from how his men battled to the last. 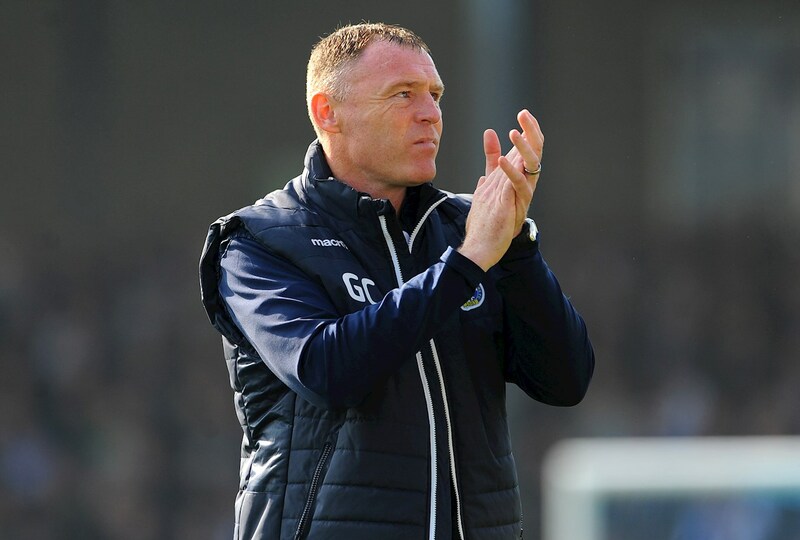 After tinkering with the system and personnel in a defeat at Doncaster in midweek, Coughlan reverted to a setup that has worked well for him. Back came the midfield diamond, with Ed Upson anchoring, Liam Sercombe at the point, and Ollie Clarke and Abu Ogogo asked to do the legwork in between. This matched Luton’s own successful strategy, as the league leaders have used the diamond to very good effect this season. Losing only four games this campaign, the last of which came on 13th October, the Hatters were a formidable force to say the least. Rovers started the game confidently, with the ball barely leaving the Luton half in the first five minutes. A pair of free-kicks were repelled, Jonson Clarke-Harris missed his kick in a good position, and Tom Nichols could not connect effectively enough with a ball from the left. Luton began to edge into the game, with a close-range shot blocked by well by Tom Lockyer, followed by a clutch of clever low passes that Rovers pushed away, then had to bravely defend corners. In the end, a Jack Stacey run down the right hand proved too much for Rovers to handle, and his low cross was tapped in at the far post by Collins. The forward had been in an offside position from an initial pass forward, but avoided a flag largely because of intricacies of the current law. By the time Stacey squared, he was back onside, and gleefully accepted the facile finish. Kazenga Lua-Lua was cast in different roles, depending on your allegiance. A hero to the Luton fans, who sang his catchy chant, and revelled as he looked dangerous on the left, he was looked on differently by Rovers fans, who did not appreciate his refusal to return two balls to Gas players to continue play, then ploughed into James Clarke with scant regard for his opponent. Referee Charles Breakspear was rather lenient in opting for just a talking to. The uber-confident visitors were not overwhelmingly dominant, but certainly looked a threat whenever they went forward, and it came as no great shock when the lead was double. James Justin’s run down the left flank ended with a semi-blocked cross, and the ball fell to Berry just inside the area. His shot was not clean, but it was effective, and crept into the corner of the net. Two goals down, with half-time approaching, one could forgive the Mem for being a little down in the dumps, but the queues for the interval refreshments had a little extra spring in their step thanks to a very fine goal to halve the deficit. Rovers played out from the back, with Liam Sercombe finding Nichols on the left and the number 10 playing a very fine ball inside to Ed Upson, who got in front of a pair of Hatters, and set Clarke-Harris away. The in-form forward still had loads to do as he headed forward to advance down the flank, flicked inside to nullify the approached defender Sonny Bradley, then fired, right-footed, past James Shea. It was an excellent team goal, completed by a man starting to build his own competitive goal of the season competition. About ten seconds after the restart, the half-time whistle sounded. It certainly was a potential momentum shifter. Six minutes into the second half Luton had the chance to quickly restore their two-goal advantage, as Stacey got to the bye-line rather too easily, and cut back for Elliot Lee, but the latter skewed over from eight yards. Rovers were well in this game, though, and limited Luton to precious few moments going forward. James Clarke was a consistent threat on the right flank, and from the second of two free-kicks earned by fouls on the right-back, Clarke himself headed over the top. Rovers continued to see plenty of the ball, but it was not a game full of chances at either end. Graham Coughlan brought on Alex Jakubiak for Nichols to offer a new dimension up front. He would soon introduce Gavin Reilly for Abu Ogogo, but not before Ogogo played a part in a move that nearly got Rovers level. Ollie Clarke released Sercombe on the right, and his cross fell to Clarke-Harris, following Ogogo pressure. Luton scrambled, and blocked the shot at the near post. From the corner, worked short, Sercombe’s deflected shot was saved well by Shea. Then, the two subs nearly combined to good effect. Reilly came in off the left, and chipped a cross that Jakubiak could only get a glancing header to. Six minutes of injury time were played, but Luton saw them out well enough, to register yet another win on their inevitable push to promotion. Rovers, though, must take a great deal of heart from a hugely spirited display, pushing the widely-acknowledged best team in the league all the way. Rovers XI: Jack Bonham, James Clarke, Tom Lockyer (c), Tony Craig, Michael Kelly; Abu Ogogo (Gavin Reilly 83); Ed Upson, Ollie Clarke, Liam Sercombe; Tom Nichols (Alex Jakubiak 76), Jonson Clarke-Harris. Partington, Stuart Sinclair, Alfie Kilgour, Luke Russe. Luton XI: James Shea; Jack Stacey, Matty Pearson, Sonny Bradley ©, James Justin; Pelly Ruddock Mpanza, Luke Berry (George Thorne 83), Andrew Shinnie, Elliot Lee (George Moncur 87); James Collins, Kazenga Lua-Lua (Harry Cornick 73). Unused Subs: Harry Isted (GK), Alex Baptiste, Jason Cummings, Alan Sheehan.